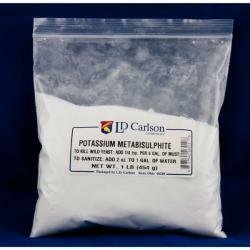 Potassium Metabisulfite is a versatile winemaking agent used primarily as an antioxidant, sterilant, and stabilizer. It prevents most wild microorganisms from growing, and it protects both the color, and delicate flavors of wine. 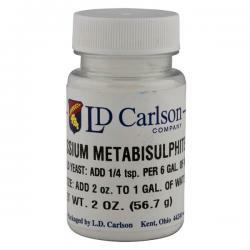 Potassium metabisulfite will lose its effectiveness over time, so a good rule of thumb is to replace your supply at least annually. Old metabisulfite can be used as sanitizer. For pretreatment of must, dose up to 1/4 tsp. per 6 gallons of must to provide 75 ppm of SO2. To stabilize fermented wine, dose up to 1/4 tsp. per 6 gallons of finished product for solid protection of wine and to allow for back sweetening of wine with no additional fermentation. To use as a general sanitizing solution, dilute 2 tsp. of metabisulfite in a standard size spray bottle with water to provide a 1% solution suitable to spray all equipment used in the winemaking process. Citric acid is the primary acid found in lemons, limes, and other "tart" fruits. Added to taste, it will provide the extra bite missing in some wines. Recommended dose is to add to taste beginning with 1/2 tsp. per 5 gallons of wine. 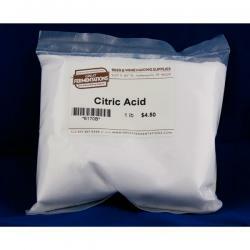 Citric Acid can also be used as an excellent sanitizer by making a 3 to 1 blend of citric acid and potassium metabisulfite.